Rest please ask me. 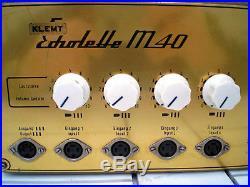 Vintage Klemt Echolette M 40 Tube Amp Germany 1962. With a special tuning-adaptor!!!!!! And is in good. Very easy to use with enclosed instructions. Everything works fine as it was just fixed and reconditioned in Bobby Staedel’s repair shop. He is a German expert in vintage gear. 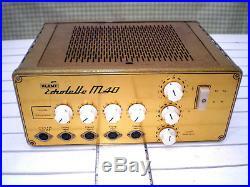 The M 40 was developed at the end of the 50′s by sound engineer Klemt and the owner of the company Echolette Hans Bauer. 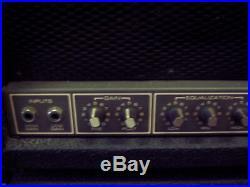 In the sixties and seventies the amp was often used by Rock´n Roll and Beat bands. 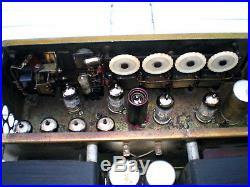 It is an all tube amp. An engineer told me that it´s circuit design is very similar to the first Marshall amps. That came out about ten years later! 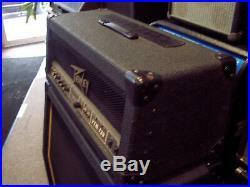 Most of today´s affordable amps are built in China what means something according to their quality and longevity. For half or a third of their price you normally get an M40 that is built like a tank. I think that´s not a real choice. Guitar players searching for the pure sound of all tube amps. Or they want to upgrade their Pod sound through real tubes. The M40 would be a very good choice for that. 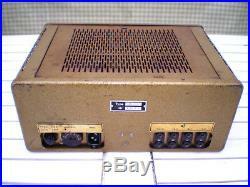 If you want to hear such amp and with a tuning adaptor, simply link in with the following youtube. M40 Vintage Amp + overdrive Adaptor. 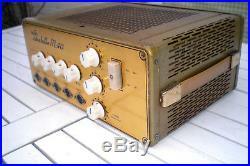 Microphone preamps with tube circuits are really sought-after. Again: the M40 could be a good solution as there are 4 very good microphone preamps in it. Harddisc Recording in general digital recording demands for tube preamps to bring analogue warmth into the sterile recordings. If you got a pair of M40s you´ll be on the right side. (not to talk about keyboard amplification or monitor purposes those are too ordinary tasks). What makes the M40 so versatile? 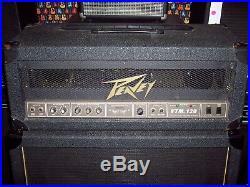 Very simple: the amp was designed in 1959 as an amp for a whole band, what meant 1x vocals, 2x guitars and 1x bass. It got 4 inputs, every input can handle a wide range from vocals to guitar. For each input you got a gain and a tone control. All 4 inputs are mixable what means simultaneously usable. Then there is a master section with a master volume and two EQ controls for bass and treble. 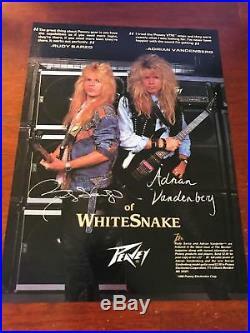 The master volume may be important for all guitar players of course. You got an Aux Send/Return (a so called 5-pin Din-jack). 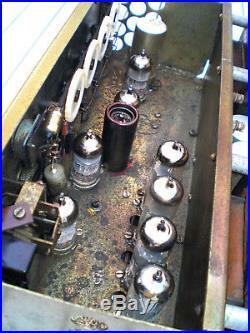 In former times this was used for connecting the legendary tape delay machine NG51. Today you can use it for all kind of effect purposes, but it offers the possibility to get the signal right after the tube preamps. Therefor you can chose each of the 4 preamps to go through that jack by push and pull mechanics on the preamp´s volume knobs! 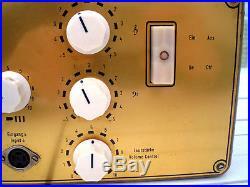 That means the digital world can get the benefits of the four excellent tube preamps! Additionally there is a general line out in former times for connecting a tape recorder. So all in all the M40 is a real allrounder but the best is yet to come! What´s about the sound you mentioned Marshall? 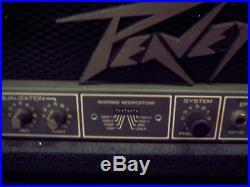 If you´d plug in a guitar you will get a real nice, very warm tube sound. But what about distortion? 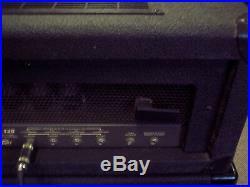 First of all: this amp wasn´t made for that. Distortion was an indication for a bad design in those days. 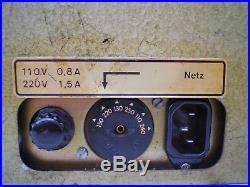 So you got to use a simple trick that all AC30 users know by now. You go into the first input, you go through a bridge-cable into a second input. And if you turn it´s volume up? 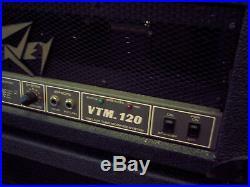 This amp turns to be a wolf in sheep´s clothing. It distorts, crunches and delivers sounds that are just as good as those known from old Vox or Marshall amps if not better! The M40 is a true pendant to Dr. The special bridge adapter cable is inclusive of course. Just recovering for a second…. If you like it clean or distorted the M40 manages all tasks and instruments in a competent manner. 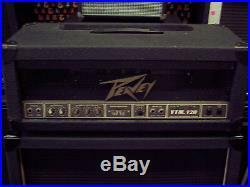 It is a typical, meaty all tube amp that cuts through the band with it´s 40W power. It is known that The Beatles and The Rolling Stones used the M40. Some say that The Shadows, Eric Clapton and David Gilmour did it as well. But that is not confirmed. This M40 is in very good shape electronically and optically. 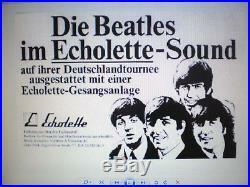 And it´s a good example for German quality, very solid. Output: 32W konstant/40W Peak. Voltage: 110 250 V (110, 130, 220, 240, 250 V). Frequency Response: 40 15.000 Hz. 4 Inputs: Din 3-pin. Aux Send/Return: Din 5-pin. Input Sensivity: 1mV 100mV. 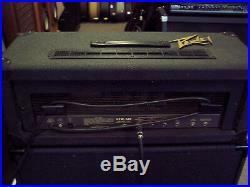 5 Speaker Outputs: 5 16 Ohm. 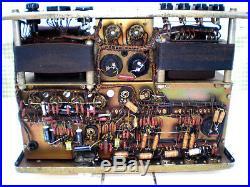 1 Spaker Output with 100 V. Tubes: 4xEL84 Telefunken, 5xECC83, 2xEZ81 Telefunken. Dimensions: 12 inch Width, 8,6 inch Depth, 5 inch Height. A power chord of course. And now it´s your turn to wake the beast! 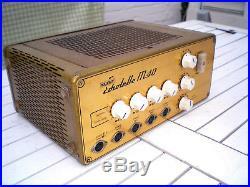 The item “1962 KLemt Echolette M40 best Vintage Tube Amp f Guitar Bass w. Marshall Sound” is in sale since Monday, December 24, 2018. 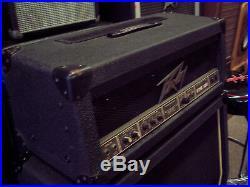 This item is in the category “Musical Instruments\Guitars & Basses\Guitar Amplifiers”. 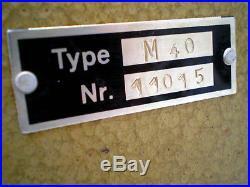 The seller is “achim5625″ and is located in Mannheim. This item can be shipped worldwide.